Hello people of the internet!!! On today’s ‘Monday Memos’ I have a new book review for y’all! Today we will be discussing ‘Noteworthy’ by Riley Redgate, which was provided for review by Amulet Books. This book was released on May 2nd, 2017, & I will put a trigger warning about the amount of profanity in this book (because there’s a lot) so if this bothers you this might be one you wanna skip. We have a lot to talk about today so let’s get to the review. Ready? Ok, let’s go!!! 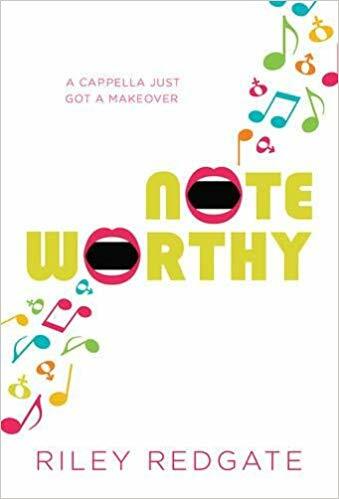 ‘Noteworthy’ is about a high school junior Chinese-American girl named Jordan Sun who goes to a very expensive, very exclusive school called Kensington-Blaine Academy for the Performing Arts. Due to the fact that Jordan has a voice type that is lower than most girls, she has a difficult time booking roles in her school’s productions. When an opportunity to join Kensington’s premier all-male A Capella group the Sharpshooters arises, Jordan decides to masquerade as a boy for a chance to join the group & compete in an upcoming contest the Sharpshooters are in to win the opportunity to travel on a tour with a professional A Capella group called Aural Fixation. Due to the fact that Jordan is a scholarship student & her family is doing worst & worst financially, she feels that if she is able to go in this tour that her parents will finally see that her education at Kensington is worth the high price tag they have to pay for books & travel to & from the school every year. She also feels that her parents don’t support her dream of becoming an entertainer, so she hopes that they will fully support her dream if she wins a spot on this tour. Ok now let’s dive into the review. I really wanted to like this book. I tried you guys, I really tried to like it, but I just couldn’t. This book had so much going for it: diverse characters, some funny dialogue between the characters that really made you love them, & show choir. I’m all about show choir you guys, I was in show choir for a little while in high school, so believe me when I say that I will always pick up a book that centers around music or musical theater. Unfortunately for this book, the problem was that it’s just so boring! The plot is super slow, Jordan is really annoying at times, & about half way through the book I wanted to drop it (and honestly if this hadn’t had been a review copy I would’ve dropped this book). I kept skimming through the last half of the book because I just wanted it to be over so I could move on to something else. Because of this I have to give this book a 1 smiley face review & will probably never read anything from this author again because her writing style just did not click for me. All photos and information used in this blog belong to Twitter, rileyredgate.com, YouTube, Tumblr, Instagram, Facebook, Riley Redgate, and any and all producers, authors, publishers, and/or businesses that should receive credit for any book(s), mentioned in this blog post, all of the and all companies, individuals, corporations, managers, writers, producers, and/or businesses that should receive credit for anything mentioned in this blog post, and all original owners. I do not own anything in this blog. If any people, corporations, businesses, companies, etc, were not previously given credit for their work, they are given credit now and their previous absence was unintentional. All opinions expressed in this blog are my own. I wrote this blog for entertainment purposes and no copyright infringement is intended. celindareyesblog October 9, 2018 No Comments on Monday Memos: Book Review of ‘Noteworthy’ by Riley Redgate. Category: Book Reviews, Monday Memos. Tagged: book review, contemporary, facebook, instagram, music, Riley Redgate, rileyredgate.com, romance, show choir, tumblr, twitter, YA, young adult, youtube.